Mini-Kits have a range of RF Power amplifier Kits covering the HF to Microwave bands using either Mitsubishi RF MosFets, RF power modules, or modern PHEMT MMIC's. The VHF 2M 8 Watt RF Amplifier uses the Mitsubishi RA08H1317M module, and is suitabl.. The UHF 70cm 7 Watt RF Amplifier uses the Mitsubishi RA07H4047M module, and is sui.. This RA-VHF Mitsubishi amplifier Kit is suitable for most RA series modules u.. The RA-UHF Mitsubishi amplifier Kit is suitable for most RA series modules up to 60W .. The 1.2GHz +27dBm ( 500mW ) amplifier is a highly linear driver amplifier that is .. 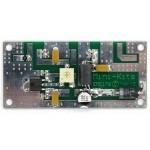 The Mini-Kits EME210 16 Watt HF Amplifier Kit is part of a building block to constru..